The health care issue could be covered from various angles. There is the politics of the issue. There is the substance of the bill. There is the lobbying effort. There is the impact of the economic crisis on health care. And there is coverage of the health care system itself, what works and what doesn’t, what needs to be fixed and what is all right. While there was certainly a lot of coverage of the bill, the framing and mix of what got covered may have contributed to the public’s confusion on the issue. While the largest component, by far, focused on politics, only a small fraction highlighted the issue at the core of the debate—how the U.S. health care industry actually functions. Not surprisingly, given the highly polarizing and political battle over health care reform, the dominant thread of the coverage was the horserace aspect. Indeed 41% of all the coverage focused on the tactics and strategy used by both sides in the legislative fight. Another 8% of the health care coverage involved the nuts and bolts of the legislation process, essentially how the measure was wending its way through Capitol Hill. 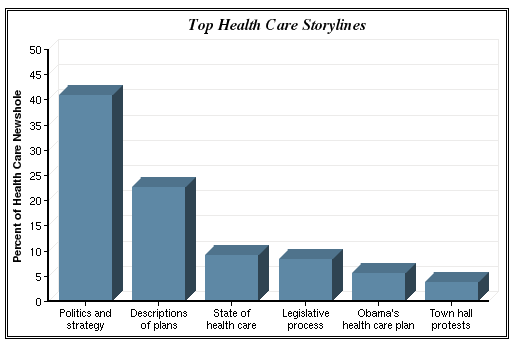 Descriptions of the various plans and proposals for health care reform accounted for 23% of the coverage, the second-largest storyline. Some of those stories contained substantive analyses of the various legislative proposals. But many others, while outlining the elements of the proposals, also focused on the political calculus for passage. In the 10 months from June 2009 through March 2010, only 9% percent of the overall health care coverage was devoted to the current state of an industry that consumes one-sixth of the U.S. gross domestic product and affects virtually every citizen. The only sector to really devote significant coverage to the workings of our current health care system was newspapers, which devoted 18% of its front-page coverage to that theme. The top online news sites devoted, by contrast, 8% of their health care coverage to that angle, network news 8%, cable news 4% and radio 4%. By way of comparison, the town hall protests, which essentially amounted to a one-month story, filled 4% of the overall health care newshole over the life of the legislative battle, though they accounted for 23% percent of the health care coverage when they occurred in August. In addition, three discrete and fleeting events—Obama’s September 9 health care speech to Congress, Rep. Joe Wilson’s “you lie” outburst during that speech, and the February 25 bipartisan summit— combined to account for another 4%. Taken together, the four-week town hall protests and the three other one-time events almost equaled the coverage of the health care system over the 10 months of the legislative debate.